The Slovakian company GAMAaluminium applied all its experience in the production of aluminum heat sinks to design a new luminaire for street lighting with excellent thermal conductivity. “GAMAStreet” is equipped with high-quality Oslon Square LEDs from Osram Opto Semiconductors featuring high efficacy and superior robustness. 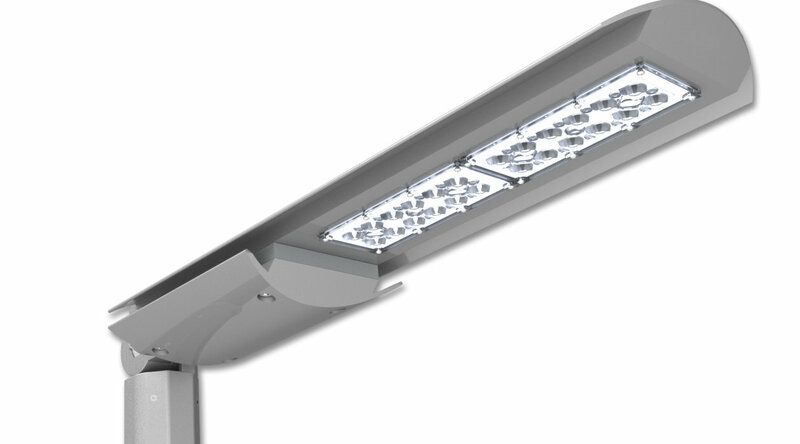 High programming flexibility means that the light output of the street luminaire can be optimized for various types of application. Thanks to the extruded alloy EN AW 6060, GAMAStreet features excellent thermal conductivity. The alloy fulfils a dual function as it operates as a heat sink for the internal electronic equipment and enables the luminaire to perform reliably even in tropical weather conditions by offering a comfortable thermal resistance reserve. The low-profile housing ensures that the street luminaire easily withstands side wind effects and facilitates self-cleaning of the top surface. The high-power Oslon Square LEDs from Osram Opto Semiconductors are mounted on the luminaire’s heat sink in replaceable LED modules. The light sources are very robust. They offer long lifetime and low thermal resistance and are therefore ideal for street lighting. The optical properties of GAMAStreet are determined by low-loss optics suitable for classes ME4 and ME5. These are directly mounted on the luminaire’s body without an additional cover that would reduce the diffuser’s efficiency. GAMAStreet’s total system efficiency is 115 lm/W. High programming flexibility (AstroDIM, StepDIM, DALI, MainsDIM) means the light output can be optimized for various conditions of use. By using Osram’s Optotronic driver the luminaire offers protection against high overvoltage of up to 8 kV in standard mode. Thanks to a high-quality housing and Oslon Square LEDs GAMAStreet offers a long lifetime. Silicone sealing provides an IP 67 rating that ensures protection against dust and splash water. By combining a functional and well-designed housing with Osram electronic equipment, GAMAStreet is ideal for customers who expect a minimalistic approach to LED technology within a luminaire. For more information on GAMAStreet go to the company’s website at www.gamaaluminium.sk. For further information on Oslon Square LEDs please refer to our product catalog.